This is a brand new, fully-licensed, 24" X 36" retail movie poster for the 1972 Francis Ford Coppola classic The Godfather. 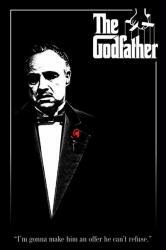 The poster features Marlon Brando as Don Corleone and is entitled The Godfather - Red Rose. The poster includes the now famous quote, "I'm gonna make him an offer he can't refuse."